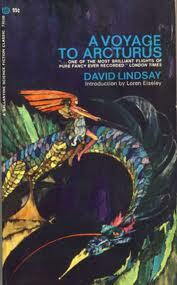 A charming and satiric fantasy. Dr. Lao's circus pulls into the dusty little town of Abalone, Arizona, beguiling the jaded residents with impossible creatures and tapping into their deepest dreams and desires. Published in 1935, Finney's book is escapist entertainment, but with a particular bite. The residents are, for the most part singularly unimpressed with the parade of chimeras, satyrs, sea serpents, hermaphrodites and unicorns. "Whatsah mattah? You tink someblody makeum fool allah time. I no fool you. You come this place looky look; you looky look. By Glod, I no charge you nothing. You go in flor nothing; takeum whole dam family flor nothing. You see: I no fool you. This place no catchum fake. This my show, by Glod!" "Don't be foolin' with that animal, mister..."
"Well, I paid you, read my future." "Tomorrow will be like today, and the day after tomorrow will be like day before yesterday," said Apollonius. "I see your remaining days each as quiet, tedious collections of hours. You will not travel anywhere. You will think no new thoughts. You will experience no new passions. Older you will become but not wiser. Stiffer but not more dignified. Childless you are, and childless you shall remain. Of that suppleness you once commanded in your youth, of that strange simplicity which once attracted a few men to you, neither endures, nor shall you recapture any of them anymore. People will talk to you and visit with you out of sentiment or pity, not because you have anything to offer them. Have you ever seen an old cornstalk turning brown, dying, but refusing to fall over, upon which stray birds alight now and then, hardly remarking what it is they perch on? That is you. I cannot fathom your place in life's economy. A living thing should either create or destroy according to its capacity and caprice, but you, you do neither. You only live on dreaming of the nice things you would like to have happen to you but which never happen; and you wonder vaguely why the young lives about you which you occasionally chide for a fancied impropriety never listen to you and seem to flee at your approach. When you die you will be buried and forgotten and that is all. The morticians will enclose you in a worm-proof casket, thus sealing even unto eternity the clay of your uselessness. And for all the good or evil, creation or destruction, that your living might have accomplished, you might just as well has never lived at all. I cannot see the purpose in such a life. I can see in it only vulgar, shocking waste." "I thought you said you didn't evaluate lives", snapped Mrs. Cassan. The evening ends in a an impossible phantasmagoria under the bigtop, with a full scale sacrificial ritual to the great god Yottle complete with virgins, a spectacular from which the townsfolk file out and home to bed, to rest and rise another day. Finney supplies a detailed and hilarious appendix cataloging in minute detail the residents of the town, the beasts, and the questions and contradictions in the book that pass unresolved. The Bison Books edition includes the wonderful illustrations by the appropriately exotically named Boris Artzybasheff. Terrific fun. 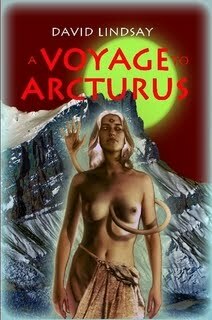 I have no critical expertise with regard to science fiction, and don’t count myself as a particular fan of the genre, but no such expertise is necessary in making the assertion that A Voyage to Arcturus is a seminal novel with far reaching influence in the realms of science fiction and fantasy. Published in 1920 in the aftermath of the Great War, Lindsay’s novel represents a quest for a utopia, a philosophical search for the ideal condition to which man must aspire, but doomed to end in the pessimism which was the enduring legacy of that war. Tweedy ol’ Professor Lewis found in this book inspiration for his own Space Trilogy, and recommended it highly to Professor Tolkien. Decades later, Harold Bloom praised the novel enthusiastically, and, picking up on the many Gnostic elements in the tale, attempted a sequel, a Gnostic fantasy entitled The Flight to Lucifer. There are certainly others who have made a touchstone of this novel. It is a classic of science fiction, but not the comparatively mundane sci-fi of Verne and Wells, but rather a whole different breed. There is little in the way of hardware or mechanics of space travel: there are no ray-guns or esoteric technologies (the means by which the protagonist, Maskull reaches the Arcturian planet Tormance is almost laughable: the flimsy spacecraft is projected back to Arcturus by means of some “reverse rays”, kept corked in a bottle, which travel back to their source), but one can easily imagine the producers of a film like “Avatar” seeking inspiration in the exotic and dynamic life forms of Tormance. The hero Maskull, who is himself a bit of an odd duck on planet Earth, witnesses a strange physical manifestation during a séance in an English country house. He is approached by a stranger, the demonic Krag, who proposes that he and a companion meet at an abandoned observatory in order to partake in a particular adventure – travel to the region of Arcturus, a distant binary star system. The scenes in the observatory are weird enough, for the structure is clearly a portal through time and space, but once on Tormance, the magical mystery tour begins in earnest. I won’t catalogue the personalities Maskull encounters in the strange realms of this distant world. His adventures are rather episodic, with each encounter exemplifying a particular lifestyle seen by its adherents as ideal, and while there are various ethical and moral viewpoints presented, Lindsay most definitely has some perspectives on sexuality that were ahead of their time. Once on Tormance, Maskull finds he has the peculiar ability to sprout (and lose) extra limbs and manifest new sense organs as necessitated by the situation. This seems to be entirely appropriate to the planet, which in itself seems to be in a constant state of dynamic change. There are strange life forms and landscapes that seem to mutate constantly, and new colors occasioned by the fact that each of the two suns around which the planet revolves emit an idiosyncratic spectrum of light. One can detect some Buddhist concepts floating around in this novel, none perhaps so obvious as the Buddha’s admonition that “change is inherent in all things”: on Tormance, change appears to be fast and constant. Lindsay invents some remarkable descriptions for the planet, and they are one of the beauties of this well-imagined novel. Another peculiarity of Tormance is that it appears to be a sort of ghost world. The entities that Maskull encounters are almost all solitary, or at least live in solitary surroundings. Again, there is no indication of “civilization”, and no evidence of advanced technologies. The higher powers, which must be imagined as dieties, seem to be specific to the planet, and do not seem to possess omnipotence, another mark of the Gnostic demiurge. It almost seems to be a planet of anchorites, each integrated into a unique landscape, or perhaps into its own private heaven or hell. Maskull was invited to Tormance with the full understanding that his death would be inevitable. 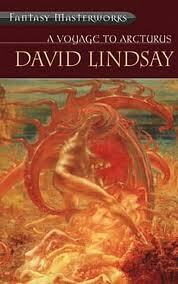 The few days’ time in which the narrative takes place form a quest, a quest for a Gnostic demiurge known variously as Shaping, Surtur, and Crystalman (the latter being known primarily through the sardonic death mask which reshapes the face of the deceased immediately after death - a remembrance, perhaps, of the war dead Lindsay had seen in the trenches). One must also mention that Maskull has the odd and disturbing compulsion to murder just about every sentient being that crosses his path on this alien world, either through anger, self defense, or simple misadventure. Maskull is quite the fickle soul, making an earnest promise to the first ethereal space sylph he meets to abstain from eating any living thing during his sojourn (the intoxicating water should suffice), but abandoning the vow at the first whiff of some extraterrestrial barbecue. In fact, for all his avowed independence, Maskull seems to be putty in the hands of every alien he meets, coming round to each of their unique philosophical points of view with alarming facility. The downside of this (for the alien, that is) is that he doesn’t need much persuasion to bash one alien’s head in with a handy rock so that he can move on to the next chapter of his intergalactic pilgrim’s progress, for Maskull is heading for a revelation, and he ain’t got time to waste. Fascinating as it is in places, A Voyage to Arcturus has, through much of its narrative a rather tedious quality for the 21st century reader. It is one of those influential novels the daring of which has become blunted with time and imitations, but which was close to inaccessible for its contemporaries. 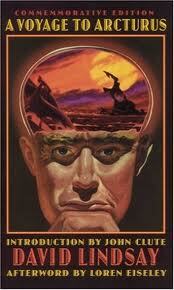 It is certainly a necessary read for anyone interested in the roots of modern fantasy and science fiction. It is available as a volume in Gollancz’s excellent “Fantasy Masterworks” series, and in an edition of Bison’s equally worthwhile “Frontiers of Imagination” series.